Fastening is usually that part of earrings we don't pay much attention to. But we should be interested in it, because not everyone likes to wear all kids of earrings and also each person likes something else. Jewels like many other things are affected by fashion and their popularity changes over time. Using and popularity of fastening varies according to the locality where the jewel was made and also according to the type of earrings and their value. 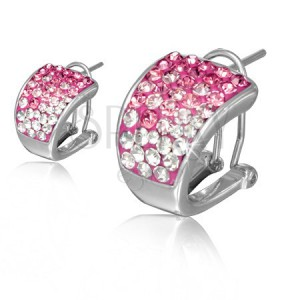 Ladies patent is commonly used type of earring fastening. Almost every woman who regularly wears earrings knows it. It is one of the most famous and most used types of earring fastenings in Europe. It is the type of fastening in which the hook is inserted to the earlobe and closed by a mechanical ear clip to prevent earrings from falling out of ear. Lever back closes the earrings and ensures that the earrings won't fall out. Its big advantage is that it is fastened in the quick and at the same time safe way. 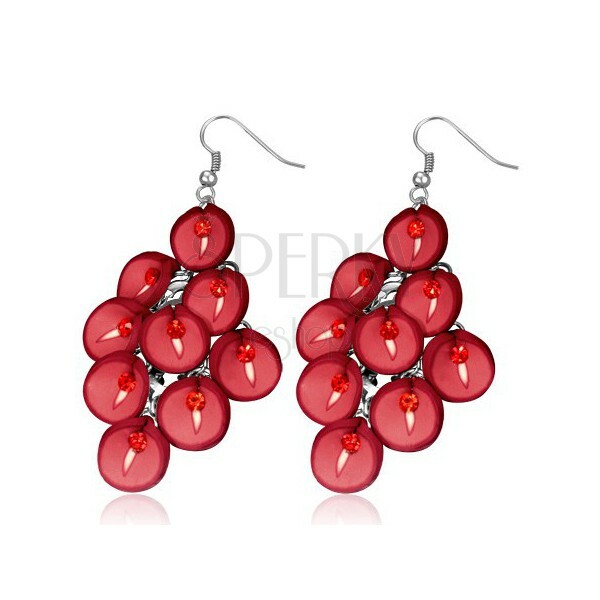 However, it couldn't be used with any kind of earrings, it is mostly suitable for bigger jewels. Latch back is similar to more widely used lever back fastening. It is also popular with women because this fastening is almost invisible (hidden behind the earlobe) and it does not affect the shape or design of earrings. At the end of the post, there is a fine groove to which can be fastened the second movable part. 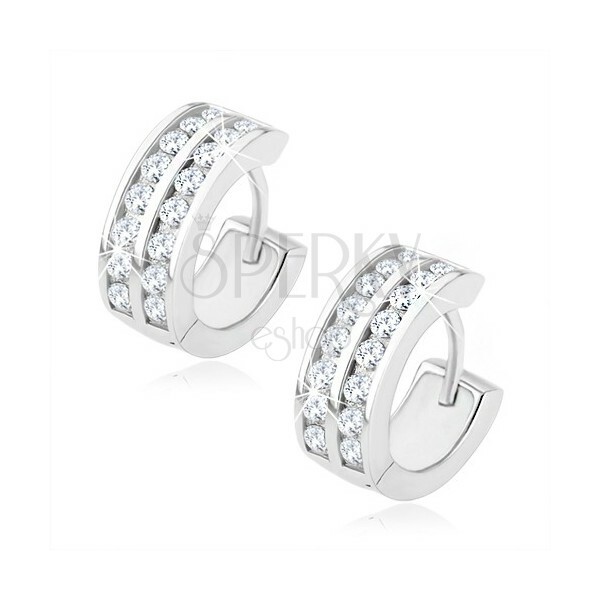 This fastening is preferred by some jewellers because earrings look more elegant with it. It is used for bigger earrings or party jewels. Some jewellers call this earring fastening a French fastening. Universal and most favourite type of earrings. Thanks to its simple design, this fastening type is used for almost every kind of earrings of small sizes and shapes when other fastening types couldn't be used. Because of the size, these earrings are suitable for children and active women. Discreetness and small size is their advantage. Fastening is simple, the post is attached to the back side of the earring, it is inserted to the earlobe and fastened with a so called friction back which can be made of metal or silicone. Earrings of this type should not be missing in any women's jewellery box. However, there are several disadvantages, e. g. the earrings can fall out which presents a problem especially with children's earrings. There is a risk that children could lose or even swallow them. There is also another type of fastening which is derived from the stud closure – screw back or threaded back fastening. It fastens the same way as stud closure, but the friction back is mounted on post with a thread. This eliminates the main disadvantage of stud closure – the risk that you could lose the earrings. African hook is used only for dangling earrings. The fastening is popular mainly with silver earrings. They can be quickly fastened on ear, Afrohook is just inserted into the earlobe. Earrings optimally weight down the earlobe so they won't fall out of ear. The hook can sometimes be additionally secured by a silicone friction. It is necessary to put earrings with African hooks aside before sleeping. These earring types became very popular. Firstly, they were used only with fashion jewellery, but nowadays, we can find them also with jewels made of gold, platinum, silver and other precious metals. Is there anyone who isn't familiar with big and dominant circles which are so typical for some women? Many of them couldn't imagine their look without them. There are two types: in the more common type called spring closure, the wire or post is inserted into the opposite tube. Other type is less common and it is called French lock, in which the earwire snaps into the opposite fork-shaped part. Nowadays, we include among circular earring types not only hoops, but in fact all shapes which are closed – i. e. they begin and end behind the earlobe and they are comprised of a thinner metallic part. 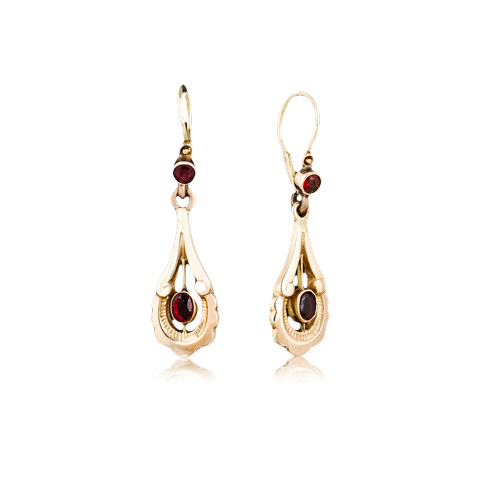 These earrings can be complemented by various decorations, inlaid with diamonds or gemstones. They are usually made of gold or silver. 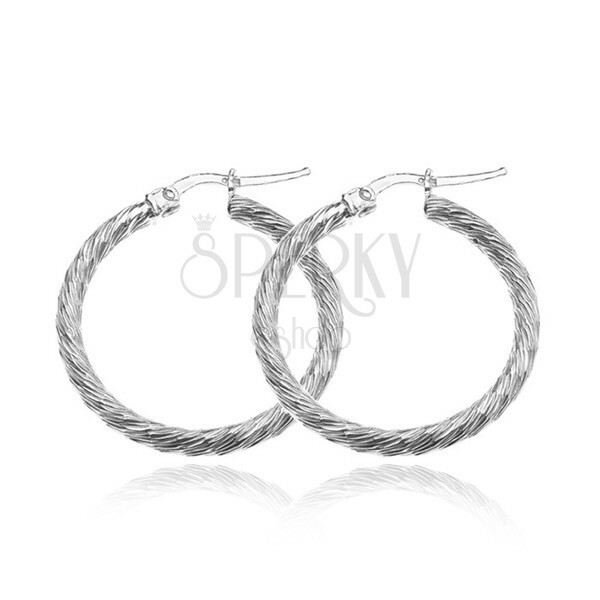 Hoop earrings can be today found in retro style and in various sizes, designs or price categories, that's why they suit every woman if she chooses well. 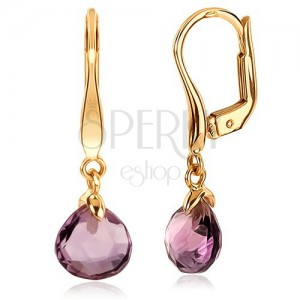 This fastening is well-known among women and it is also popular with men's earrings. 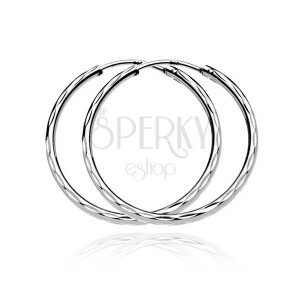 It is used especially for small circles with a mechanical part in the middle which divides earrings into halves. The earring opens in the hinge. Fastening comprises a post with a groove which fits into the opening with a characteristic “click“ sound. This type of fastening is not as common as the lever back fastening, but it is quite handy. It combines older types of ear clips which are used for unpunctured ears with the lever back fastening and stud closure. In this the type of fastening, the post is inserted into the earlobe and ensured with a clip which is known from the classic clip-on earrings. It is mostly suitable for massive designs. 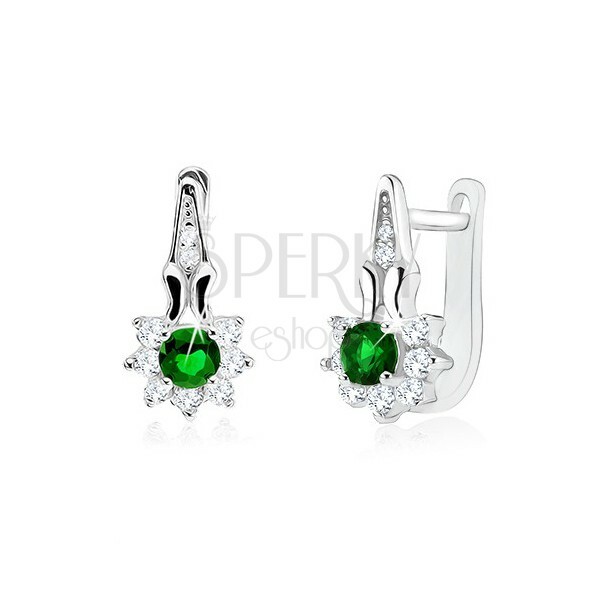 The omega clip ensures that the earring won't fall out of ear, which often happens with the classic clip. It is the type of fastening which was developed especially for children's earrings. This type prevails mainly in Czech Republic and Slovakia and it is suitable for babies up to school-age children, i. e. who are 6-8 years old. Earrings with this fastening close at their front part. There is a small ring in the upper part of the earring decoration to which is attached a movable part of the fastening. Small hook is simply inserted to the circle. Fastening closes the earring so it won't fall out. Jewellers sometimes make a lock for this earring type. This modern fastening type is used for longer, usually chain-type earrings. Only half of the earring is threaded through the ear hole which keeps it in place. Fastening is less reliable and inappropriate while doing some physical activity.